NBA: The Dallas Mavericks lost Dirk Nowitzki to a knee injury in the second quarter, but beat the Oklahoma City Thunder 103-93 on Monday night for their 17th victory in 18 games. Nowitzki scored 13 points before leaving with 9:10 left in the second with what the Mavericks said was a sore right knee. 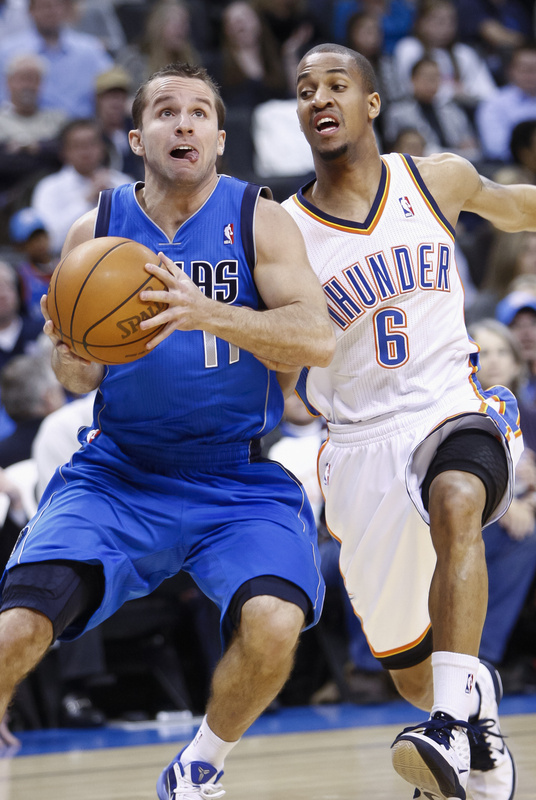 Shawn Marion led the effort to replace him, scoring 20 points off the bench. Dallas improved to 11-1 on the road this season , best in the NBA, and 24-5 overall. Kevin Durant scored 28 points and James Harden had 18 for the Thunder, who dropped their second in a row to the Mavericks this season. • Aldridge scores 26 as Blazers upset Jazz: LaMarcus Aldridge scored 26 points, Wesley Matthews had 14, and the Portland Trail Blazers halted a four-game road losing streak with a 96-91 victory over the Utah Jazz. Deron Williams had 31 points, including back-to-back 3-pointers that pulled the Jazz to within 94-91 with 7.7 seconds left. But Andre Miller made a pair of free throws to seal the win for Portland. The Trail Blazers went on a 14-0 run in the third quarter to take a 60-53 lead and went on to avenge a 103-94 loss in Portland on Nov. 20. • Howard’s double-double leads Magic over Nets: Dwight Howard had 19 points and 13 rebounds, and the Orlando Magic won their third straight with a 104-88 victory over the New Jersey Nets. Hedo Turkoglu scored 20 points as the Magic had six players in double figures. Devin Harris had 24 points to lead New Jersey, which lost its second straight and for the eighth time in 11 games. Brook Lopez added 20. • Shaq fined $35,000 for ref comments: Shaquille O’Neal has been fined $35,000 by the NBA for his public comments about the officiating. O’Neal criticized the referees following the Boston Celtics’ 86-78 loss at Orlando on Christmas. He was angry after picking up his sixth foul when Magic center Dwight Howard fell to the ground as they were wrestling for position. College Basketball: Ashton Gibbs scored 21 points as Pittsburgh’s balance overcame Kemba Walker’s one-man offense for No. 4 Connecticut, and the No. 6 Panthers easily won the Big East’s first matchup of Top 10 men’s teams by 78-63. Walker scored 31 points, but missed 17 of 27 shots as Pittsburgh repeatedly limited the Huskies to a single shot in a possession – often a bad one. The Huskies shot 31.7 percent. NHL: Blake Wheeler scored the only goal in the shootout to lead the Boston Bruins to a 3-2 victory over the Florida Panthers. Tim Thomas made 32 saves. He then stopped Mike Santorelli, Stephen Weiss and Evgeny Dadonov in the shootout. • Rangers rout Isles with 52-shot performance: Defenseman Matt Gilroy broke a long scoring drought with his first two-goal game in the NHL, and the New York Rangers recorded a season-high 52 shots to cool off the surging New York Islanders with a 7-2 victory. The Rangers handed the Islanders their first loss in four games and snapped their rivals’ five-game point streak (4-0-1). • Cleary breaks ankle, out at least a month: The Detroit Red Wings will be without forward Danny Cleary for at least a month after he broke his left ankle on a shot attempt by a teammate Sunday night in Minnesota. Cleary was injured in the third period against the Wild when a shot struck his ankle. Cleary scored his team-leading 16th goal earlier in the game. • Blackhawks hope Kane ready for Blues: The Chicago Blackhawks hope to have star Patrick Kane back in the lineup after missing three weeks with a left ankle injury when they visit the St. Louis Blues today. He went through a full workout on Monday and, barring a setback, is expected to be ready for the game. That would be another big boost for a team that has won four straight. • Tootoo enters substance abuse program: Nashville Predators forward Jordin Tootoo voluntarily has entered into in-patient care through the NHL-NHLPA substance abuse and behavioral health program. Tootoo will be paid his full salary, and the NHL said in a statement he will face no penalty as long as he complies with his treatment and the followup care program. • Spezza out indefinitely: Ottawa Senators center Jason Spezza is out indefinitely with a right shoulder injury. Spezza was hurt moments after he got his third assist in the second period of Sunday night’s 3-1 win over Pittsburgh. He left the game after being checked into the boards. Spezza said Monday it didn’t look like surgery would be required. NFL: San Francisco team president and CEO Jed York is turning to his uncle, former 49ers owner Eddie DeBartolo Jr., for advice on how to turn around the team after firing coach Mike Singletary. DeBartolo will serve as a consultant in the process of finding a general manager. Only after a GM is in place will a new coach be hired; there’s no timetable. Jim Tomsula will coach the 49ers for all of a week. Also fired were pass rush specialist coach Al Harris and inside linebackers coach Vantz Singletary, the former coach’s nephew. • Kitna to start for Cowboys if OK; McGee preparing: Jon Kitna will be the starting quarterback for the Dallas Cowboys in their finale Sunday if his strained abdominal muscle heals enough. If not, second-year reserve Stephen McGee is likely to make his first career start. • Ex-Dolphin Laakso dead at 54: Former Miami Dolphins tackle Eric Laakso, a member of two Super Bowl teams in the 1980s, has died at age 54. Laakso, who had battled heart disease, was found dead at his home Saturday.